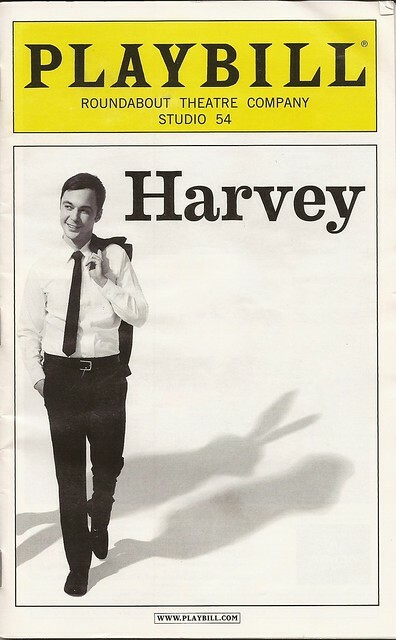 While in NYC last month, PJ and I saw Harvey, starring Jim Parsons and Jessica Hecht. In fact, one of the reasons we went to New York was to see this play. I remember seeing it as a kid — my parents love old black and white movies, and I was interested in seeing it on the stage. Plus, I love The Big Bang Theory, and, now that Jim Parsons is officially out, I really wanted to see him live too. Harvey is about an eccentric man, Elwood P. Dowd, played by Parsons, who is friends with a six-foot tall invisible rabbit named Harvey. Elwood explains to various people he meets that Harvey is a pooka, a mischievous sprite who plays tricks on people. Elwood’s sister and niece, who live with him in the family’s ancestral home, have had enough of Elwood’s behavior. Embarrassed one too many times by his introduction of his invisible friend to their acquaintances, Veta, played by Hecht, and Myrtle Mae, played by Tracee Chimo, decide to commit Elwood to the local insane asylum. When Veta takes Elwood to the asylum, however, a comedy of errors ensues as the junior, too self-assured young doctor mistakes Veta for the patient. The rest of the play involves sorting out who does and who does not belong in the hospital, with the play’s climax revolving around a new drug that can make sure Elwood never sees Harvey again. Parsons is good in this role, but it’s not really much of a stretch for him. Elwood is a slightly differently eccentric take on Sheldon, his character on The Big Bang Theory. The part doesn’t call for anything else, so it’s clear why Parsons would be cast in the role, but it will be interesting to see if he’s able to break out of the Sheldon mold for his future forays onto Broadway and film. His supporting role in the movie version of The Normal Heart might be a good indication of his career after TBBT. The play also features Carol Kane in a small, but hilarious role as the senior physician’s dotty wife. But the real star of this production is the set design, which is superb. Both the Dowd house and the hospital are realistically portrayed and realized. It’s clear to see why the Emmy winning designer, David Rockwell, has garnered Tony and Drama Desk nominations in recent years. All in all, this is a good, solid production of a classic mid-twentieth century play. It’s good, family entertainment, and audience members of all ages seemed to enjoy it. I’ve decided to teach Mary Chase’s play in my class in the fall. It will be interesting to see what my students make of it! Excellent review. This was one of my favorite movies.